A full day of tasks is addded to your diary for the week and you think, "ah, oh well no one else can do it..."
You wake up on a Saturday thinking, "I should probably have delegated that to someone else..."
First there's the moment of realisation, the open-mouthed shock. This is swiftly overrun by the hot prickling up of sweat from your scalp that instantly cools to an icy chill. Starting as a trickle down the back of your neck it gains momentum and becomes a freezing torrent that rushes down your spine before diving into your guts and viciously squeezing the life out of your stomach. The blood squeezed from your viscera is pushed to your face causing a hot flush and the cycle begins again. If the mistake is bad enough this feeling won't just be a temporary one but a near continuous loop that makes it difficult to fall asleep and impossible to stay that way. It will last as long as it takes to fix the mistake. Sometimes technology moves more quickly than you really like to think about. The picture to the left is a shotcode. 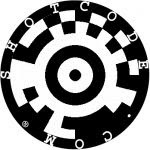 With the aid of a download to your phone from the shotcode website you can then take a picture of these graphics and the phone will automatically direct its browser to the site that it represents. The one to the left is for here. Personally I find that a little creepy but I'm going to have fun leaving these all over the place, though I might not go this far. Whilst I wait for the coffee to bring me back to life and before I engage on some of my long-planned but never acted on writing projects, one of which is now a sprawling epic of seven paragraphs, a quick update. Unbeleivably I have been doing things and not writing about them.The picture to the left is a shot from a friend's balcony accross central Sydney, in a thunderstorm. We went to her house to play poker, we left at three the next morning. The prize was a hangover and I won it in style. The Laneway Festival was great fun and I can recommend looking up almost all the acts on the lineup as they each have something different (there are links to YouTube and MySpace on the laneway site if you feel so inclined). A small section of Sydney, just a block back from Circular Quay is shut off and turned into a mini music festival on the streets with two large stages, one dj stage from the back of a pickup and one club venue in The Basement. The sofa in the picture was a doomed seat. At first it seems to be the best placed in the entire venue; not far from the least crowded bar, soft and comfy, close to the relaxed music coming from the dj etc. However it was a warm day, a very warm day. I played tennis that morning and when I finished at ten it was 43 Celsius on court. This seat had the highest turnover of occupants. I was watching and timing, nobody lasted five minutes. We have begun to grow herbs and the like on our back balcony. We have Chives, Basil, Coriander, Thyme, Parsely and Oregano growing from seed. After considerable success with it in London we also decided to see if we could grow Chillis. You can see the result of scraping out the seeds from a chilli straight from the fridge into the compost and a week of watering and sunshine, we have about 30 seedlings! When we were given a couple of chilli plants in London we lived in a house that had a terrible mouse problem and the little bastards completely ate our plant right down to the woodiest twig. We had to nurse the small stick that was left back in to leaf and eventually fruiting. It now resides in Hertfordshire and is doing very well I'm told. I will forever be wondering about that mouse. I had mental images of a rocket-propelled rodent that made me giggle like a toddler. It was this incident that ultimately spelled the end for the mice. The non-aggression pact was rendered null and void and the use of force authorised, if not completely encouraged. One week of peanut-butter baited traps dealt with the incautious and letting our neighbour's cat into the house seemed to have dealt with the rest. I'm not particularly sure how effective a hunter Wonky the boss-eyed moggy would have been but we didn't see many mice after that.